Colonel Patrick John Mercer - Cherrypickers – 11th Hussars - Online gallery supplying original fine art. Trending Modern British and Contemporary Welsh. Available for sale from Big Sky Fine Art; this original watercolour drawing by Patrick Mercer.<br> The work is presented and supplied in its’ original frame, mount and behind glass. <br> From the deceased estate of Barry Gibson, Orston Hall, Nottinghamshire.<br> <br> The title of this painting ‘Cherrypickers” is the affectionate nickname of the cavalry regiment of the British Army, the 11th Hussars, now amalgamated with the Royal Hussars. The regiment's nickname, the Cherry Pickers, came from an incident during the Peninsular War, in which the regiment was attacked while raiding an orchard at San Martin de Trebejo in Spain. <br> <br> Colonel Patrick John Mercer, OBE was born 26 June 1956 in Stockport, Cheshire. He was educated at The King’s School, Chester and Oxford, where he read history. He later trained at the Royal Military Academy, Sandhurst and was commissioned into the Worcestershire and Sherwood Foresters Regiment. He had an active and distinguished service record, which culminated in him becoming a Colonel in 1998. He completed nine tours in Northern Ireland and commanded his battalion in Bosnia and Herzegovina, Canada and Tidworth. He was Mentioned in Dispatches for “gallant and distinguished service” in Northern Ireland, earned a gallantry commendation, an MBE and later an OBE. <br> On leaving the army he became a defence reporter for BBC Radio 4’s Today Programme, reporting from a number of trouble spots, including Kosovo. He then became a freelance journalist, writing for the Daily Telegraph, contributing frequently to radio, TV and print media, principally covering security and defence issues. He has also published military accounts of events, and a historical fiction novel.<br> He is best known however as a politician, being first elected to Parliament in 2001, as the Conservative MP for Newark. During his time as MP for Newark he more than doubled his majority, making Newark one of the safest Conservative seats in the country. He initially served as a backbencher on the Defence Select Committee before becoming Parliamentary Private Secretary to the Shadow Secretary for Defence. He was also Conservative shadow homeland security spokesman before being forced to resign by David Cameron in 2007 for making "unacceptable" racist remarks in an interview with The Times. In 2011 he was appointed with Lord Ashcroft to review the future of the military bases in Cyprus, and has advised on other matters of security, including police tactics during the 2011 riots. His political career ended in disgrace however; he was forced to resign the parliamentary whip in May 2013 following questions surrounding paid advocacy. He then continued to represent Newark as an Independent MP until his resignation at the end of April 2014 after the Standards Committee suspended him for six months for "sustained and pervasive breach of the house's rules".<br> He is a patron of the Victoria Cross Trust.<br> <br> This original watercolour is of a “Cherrypicker”, an affectionate name for a cavalryman of the 11th Hussars of the British Army. <br> We see the rear of the figure, dressed in his smart military dress uniform of a dark blue jacket, with gold braid, bright red trousers or jodhpurs, also with gold braid, and long black boots with spurs. On his head is a traditional bearskin cap with a huge white and red feather adornment on top! He is also wearing white gloves and in his right hand he is holding a silver coloured sword in its scabbard. This is a jaunty piece in the style of a caricature. Available for sale from Big Sky Fine Art; this original watercolour drawing by Patrick Mercer. The work is presented and supplied in its’ original frame, mount and behind glass. From the deceased estate of Barry Gibson, Orston Hall, Nottinghamshire. The title of this painting ‘Cherrypickers” is the affectionate nickname of the cavalry regiment of the British Army, the 11th Hussars, now amalgamated with the Royal Hussars. The regiment's nickname, the Cherry Pickers, came from an incident during the Peninsular War, in which the regiment was attacked while raiding an orchard at San Martin de Trebejo in Spain. Colonel Patrick John Mercer, OBE was born 26 June 1956 in Stockport, Cheshire. He was educated at The King’s School, Chester and Oxford, where he read history. He later trained at the Royal Military Academy, Sandhurst and was commissioned into the Worcestershire and Sherwood Foresters Regiment. He had an active and distinguished service record, which culminated in him becoming a Colonel in 1998. He completed nine tours in Northern Ireland and commanded his battalion in Bosnia and Herzegovina, Canada and Tidworth. He was Mentioned in Dispatches for “gallant and distinguished service” in Northern Ireland, earned a gallantry commendation, an MBE and later an OBE. On leaving the army he became a defence reporter for BBC Radio 4’s Today Programme, reporting from a number of trouble spots, including Kosovo. He then became a freelance journalist, writing for the Daily Telegraph, contributing frequently to radio, TV and print media, principally covering security and defence issues. He has also published military accounts of events, and a historical fiction novel. He is best known however as a politician, being first elected to Parliament in 2001, as the Conservative MP for Newark. During his time as MP for Newark he more than doubled his majority, making Newark one of the safest Conservative seats in the country. He initially served as a backbencher on the Defence Select Committee before becoming Parliamentary Private Secretary to the Shadow Secretary for Defence. He was also Conservative shadow homeland security spokesman before being forced to resign by David Cameron in 2007 for making "unacceptable" racist remarks in an interview with The Times. In 2011 he was appointed with Lord Ashcroft to review the future of the military bases in Cyprus, and has advised on other matters of security, including police tactics during the 2011 riots. His political career ended in disgrace however; he was forced to resign the parliamentary whip in May 2013 following questions surrounding paid advocacy. He then continued to represent Newark as an Independent MP until his resignation at the end of April 2014 after the Standards Committee suspended him for six months for "sustained and pervasive breach of the house's rules". He is a patron of the Victoria Cross Trust. 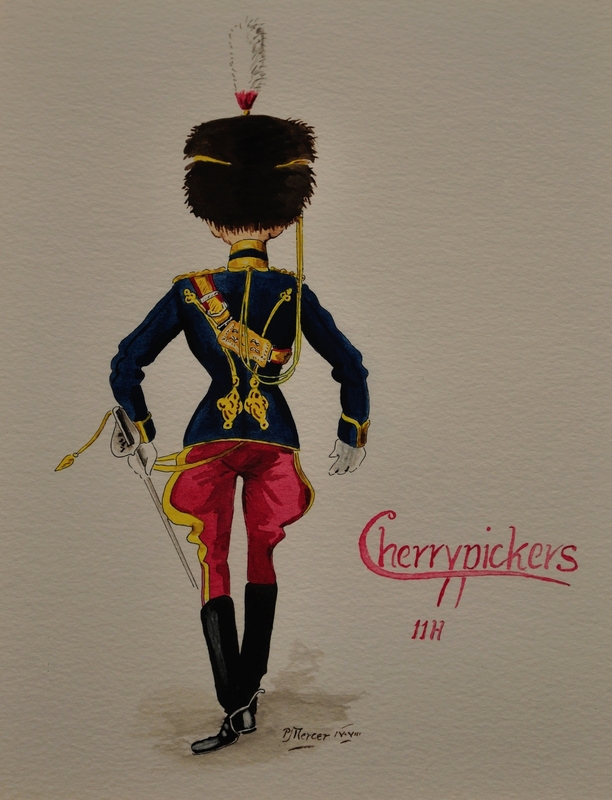 This original watercolour is of a “Cherrypicker”, an affectionate name for a cavalryman of the 11th Hussars of the British Army. We see the rear of the figure, dressed in his smart military dress uniform of a dark blue jacket, with gold braid, bright red trousers or jodhpurs, also with gold braid, and long black boots with spurs. On his head is a traditional bearskin cap with a huge white and red feather adornment on top! He is also wearing white gloves and in his right hand he is holding a silver coloured sword in its scabbard. This is a jaunty piece in the style of a caricature.